Paper Chaise is created out of my love for art, collage, beauty, elegance. I love paper, color, design, pattern, texture, shapes, and especially circular shapes. Paper Chaise began as a plain, but lovely wooden chair, which I have entirely covered with beautiful papers in my own designs. 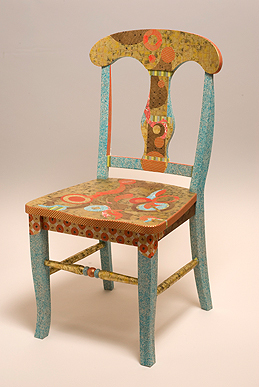 I began by gluing large areas of golden paper onto the wooden chair, and then adding other colors, textures, and shapes, making my design up as I went along. As I covered more areas with the collage, I began to have an artistic conversation with the chair. I was inspired to create a flow of colors and shapes to the form of the chair, until the paper became the chair and the chair became the paper. The chair was then magically transformed. It was fancy and elegant, and had become Paper Chaise. *Chair is "chaise" (feminine) in French. Painted Chairs Project commissioned by The Lexington, MA, Historical Society, was created to benefit the restoration of Munroe Tavern, one of Lexington's historic Buildings. 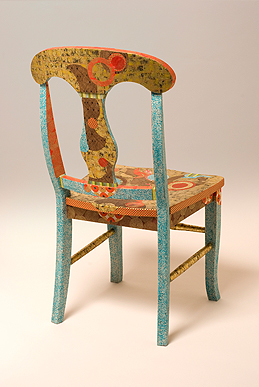 Paper Chaise was one of the six commissioned chairs, and was raffled off in 2011.